A bond breaker is a substance applied to concrete surfaces to ensure that there is permanent bonding between the surfaces. Bond breakers are used normally on tilt-up walls and precast segments to ensure the right pieces are cast together. 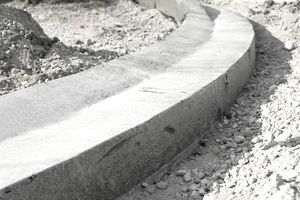 Bond breakers will allow lifting and moving of precast pieces after stripping them from the form. Bond breakers are engineered products that form a membrane, allowing the surfaces to be separated easily. In some countries wax, petroleum-based substances or grease are used as bond breakers but these chemicals will change characteristics of the surfaces on which they are applied. How much will the weather vary during the concrete pour? How does the bond breaker material need to be stored? How fast does the bond breaker dry once it has been applied? How will the finished concrete product be used and what type of chemicals, including sealants, adhesives, and coatings, will be applied on top of the concrete surface after the concrete has been poured? Are there VOC requirements that need to be addressed? Bond breakers are classified into two major groups: membrane forming and non-membrane forming. They can also be divided into water-based or non-water based products. Membrane forming bond breakers will hold water in the casting slab and they are formulated to meet ASTM C-309, the standard specification for liquid-membrane-forming compounds. These types of bond breakers are made of crude resins to form the thin film. Non-membrane bond breakers are subdivided into reactive and non-reactive. The reactive bond breaker will react forming a crude soap. The non-reactive bond breaker will interact with the concrete surface and generate a waterproof surface.